Sequestered away in rural bliss, 90 minutes north of Seattle on the Washington state coast, Karl Blau has been making records for 20 years, but never with European distribution. So, when Bella Union released Introducing Karl Blau in 2016, it shone a belated and deserved light on “one of the great hidden treasures of music,” claimed album producer Tucker Martine. But given Introducing’s specific agenda – a set of gorgeous, lush cover versions drawing mostly on vintage Nashville’s country-soul with Blau concentrating on his rich, reverberating voice, his latest album Out Her Space is so different that it could be titled Reintroducing Karl Blau. Out Her Space features all Blau’s own material, production and multi-instrumental skills, and forges a gorgeous, languid and hook-infested gumbo of soul, funk, some jazzy blowing and Afro-pop, to arrive somewhere else entirely. 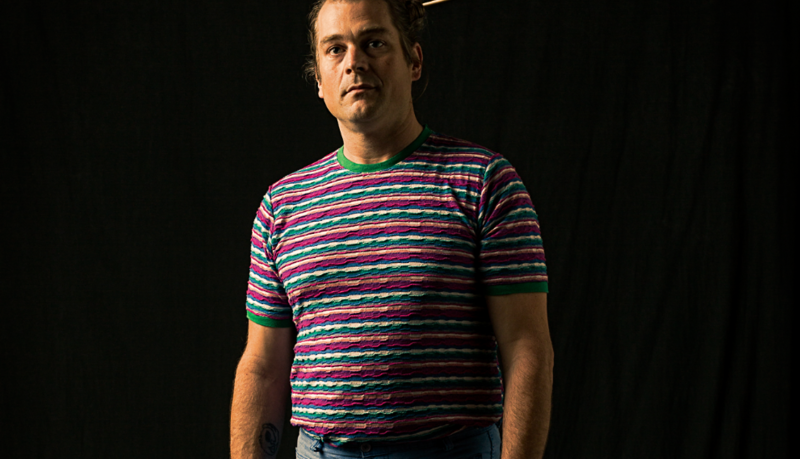 In 2012, when Matthew E. White started a new label, Spacebomb, based around a house band in the style of the old Stax and Motown ventures, he called on Blau to engineer the album. The LP that came from this partnership was White’s solo album Big Inner. Having heard Blau’s own demos, White ensured that Spacebomb’s hot-to-trot backing band – centred around (now Foxygen) bassist Cameron Ralston and drummer Pinson Chanselle – supported Blau too, and he came away with an album’s worth of tracks, which also featured Blau (guitar, percussion, synth, sax), White (guitar, synth), Phil Cook of MegaFaun (piano) and a wider cast of horns, piano, viola and backing vocals. The world is out of control, but Blau’s life is anything but. Introducing Karl Blau did its job, as a great record and an introduction to a wider audience. Given Matthew E. White was voted a ‘breakout artist’ of 2012/13, then Blau, on this evidence, is unquestionably a ‘breakout artist’ of 2017/18. If Out Her Space has finally found the right time to emerge, so too has its creator.